I am participating in my second Quilt Along, sponsored by Partners in Design. Abbie, from Sparkle On!,is the one who introduced me to this group of designers. I participated in the Christmas quilt along, which resulted in a quilt. I made a few blocks of the Fall QAL, and made small projects with these blocks. 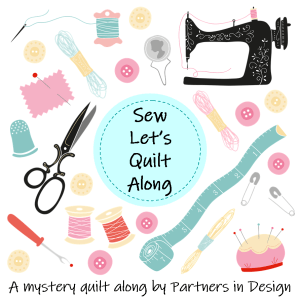 This time, the theme for the QAL is quilting…what fun! The first block is a sewing machine. I finished the second block which was released yesterday. There is nothing like a cup of coffee to get me started on a day of quilting, so this block is appropriate. I had been purchasing fabrics with a sewing/notions theme, and now, I can use them. I do not know if I will make a quilt or different small projects with these blocks. In the meantime, I am thoroughly enjoying participating in this QAL. Thanks, Abbie!